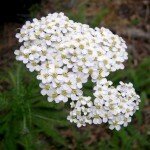 Yarrow is a delightful addition to the garden and landscape. This attractive perennial grows upright with 5 rays in flat-topped clusters, or umbels, and grows lacy, feathery foliage. 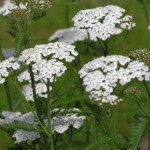 Humans and pollinating insects alike are drawn to the honey sweet fragrance that wafts from yarrow’s white umbels from May until October. 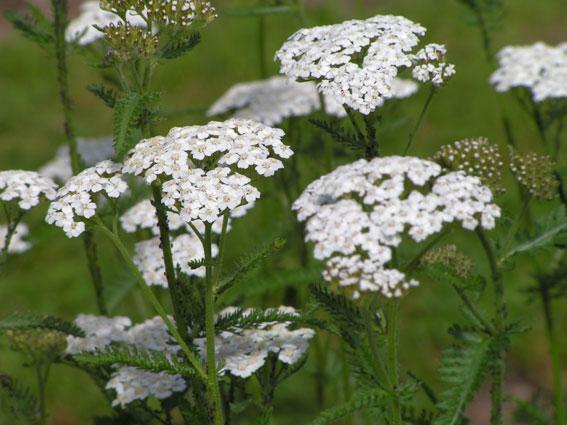 As legend would have it, Achillea is an ode to Achilles, who used a poultice of the fragrant yarrow flowers to stop the bleeding of his wounded soldiers in battle. The plant has many other medicinal properties and uses, from the treatment of the common cold to anorexia and arthritis. Have your honey bees flitting around with joy when you bring this beauty into your universe. Permaculturists like Achillea millefolium because its an insectary plant and brings pollinators and it also intensifies the flavors and fragrances of other plants and herbs growing near it. Of course, it is beautiful and many know that designing with beauty in mind cannot be overlooked.